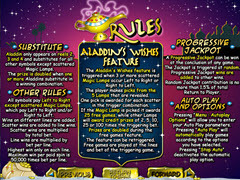 Aladdin's Wishes Pokie Review - Play today! Aladdin’s Wishes takes you to the desert where you will be able meet your favorite characters that resemble those in the movie Aladdin. 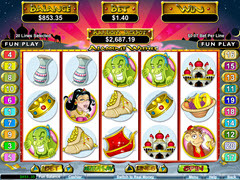 The game is a 5 Reel, 20 payline video slot created by Real Time Gaming. It offers a progressive jackpot and game features like a wild symbol, scatter symbol, multiplier and free spins. The premises of the slot is excellent and wagering is vast and far reaching allowing those with all budgets the chance to find a wager they wish to place. The lowest bet of $0.25 is allowed with its max being $5.00 per line, therefore making the largest bet $100.00 and allowing you the feeling of hoping onto your own magic carpet for a pokie ride of epic proportions. This slot game has vibrant and stunning graphics that is shown throughout the entire game. The background images are colorful and eye grabbing and this only adds to the sense of value it brings. Some of the symbols that you will see are a monkey, a palace, a lamp, Aladdin, genie, sable and Yasmin. There are additional symbols that are in place to trigger the multiple features offered in Aladdin’s Wishes. This includes a scatter symbol, which is where the free spins lay. The wild symbol in Aladdin’s Wishes is Aladdin himself. He will appear on the second, third and fourth reel. It will match all other symbols in the game but not the scatter symbol. It will also double any wins it completes on an active payline. The scatter symbol in this slot game is the lamp. When three or more are found left to right it will trigger the free spins. You will enter a bonus screen and will choose from 5 different lamps and each lamp will reward you with free spins or a coin win. You will get one pick for each lamp that appeared when the bonus was triggered with the maximum being 5 picks. You can win up to 25 free spins and up to 100 times your triggering bet. All wins are doubled during the free spins and can be triggered again while the first series of spins are being played out. Overall, this is a fun styled pokie. When you add the progressive jackpot to the picture along with the free spins you have a game ready to keep you entertained for hours. The theme also goes far towards that goal and with the chance at a 10,000 coin payday only enhances that.